Gone are the days when a bathroom is simply a place to shower and get ready for the day. Now the master bath has become a place to make a statement, to relax in a spa-like setting, and to utilize luxury finishes in a small space. 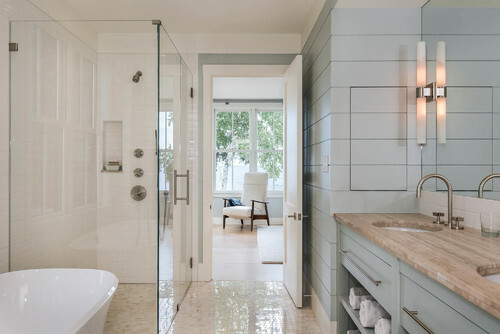 Modern bathrooms are all about clean lines, soothing colors, and unique fixtures. 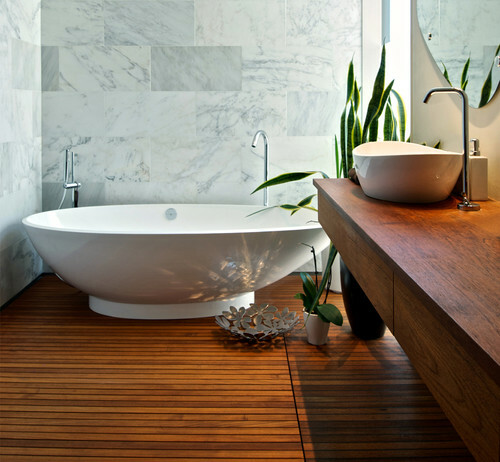 Choose a modern bathroom that fits your sense of style with these selections. There's no need for a shower curtain when your shower is surrounded by beautiful clear glass. This allows for the beautiful tile to shine through and adds a bright and clean element to this already soothing setting. This bathroom is completed by soft grey wood paneling and cabinets, and a beige marbled countertop. 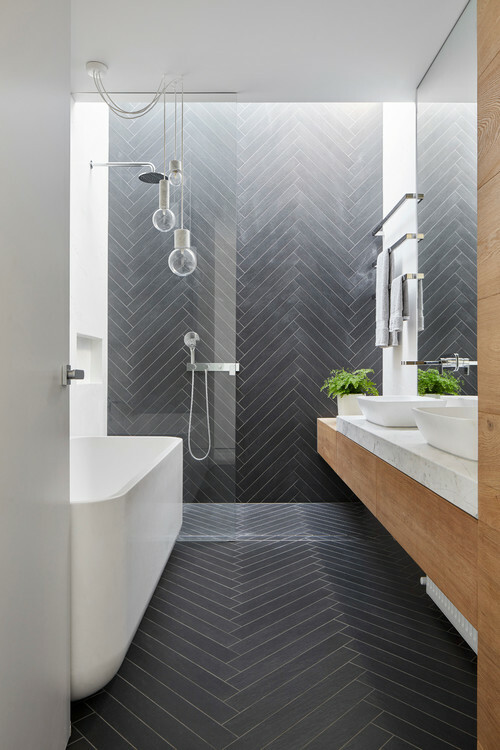 Since the bathroom is such a small space, unique wall or floor tiles go a long way. 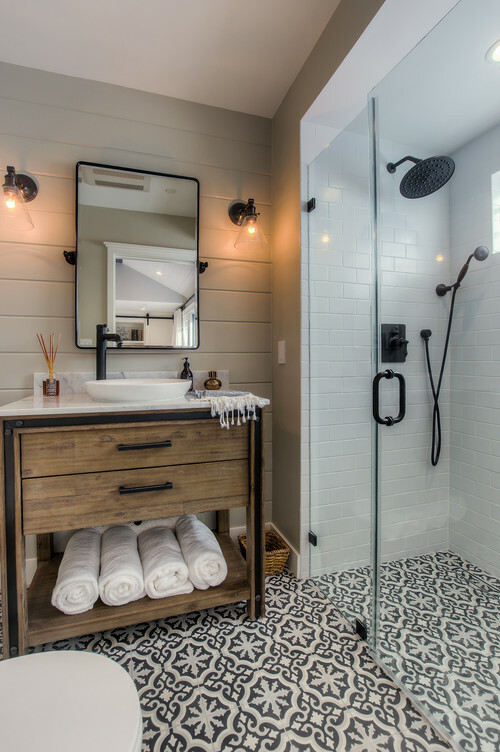 This small bath is completely jazzed up by a damask pattern floor, with shiplap wood on the walls and black and wood accents throughout. If your budget for a bathroom reno is minimal, give your bathroom an easy update by painting the cabinets yourself. If you add new sink hardware and drawer pulls, you'll have a fresh look that was easy to update. This reno was finished off with a new tile job in the shower and slate tile. Turn your bathroom into a location for rejuvenation with calming tile on the walls and wooden accents throughout the space. This bath is finished out nicely with a porcelain sink and a matching porcelain tub that looks perfect for soaking. In a smaller area, like a bathroom, you can utilize unique design ideas, such as using the same tiles on the wall and on the floor. This will make the space appear larger and edgier. Here, the design is modern with a one-of-a-kind light fixture, and wood accents. The result is a contemporary take on a regular bathroom. 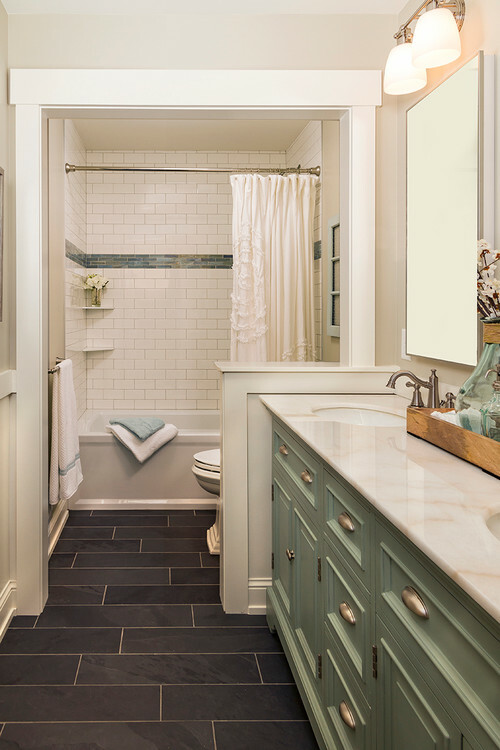 When completing a bathroom project, don't forget to add your own touches to the mix. 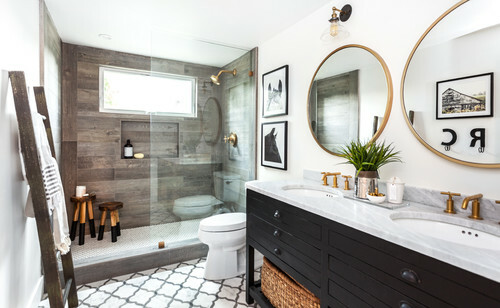 This bathroom works well with the wooden ladder towel rack, circular mirrors, art prints, and rustic shiplap wood in the shower. It looks artsy, eclectic, and fun.